President Muhammadu Buhari will not meet with members of the defunct New Peoples Democratic Party (nPDP), who are threatening to leave the All Progressives Congress (APC). Are the nPDP men capable of giving Buhari the same treatment they gave former President Jonathan which eventually led to his defeat in 2015? They have accused the ruling party and the Presidency of marginalisation and are threatening to defect to another party. The nPDP is one of the blocks that formed the APC in 2014 – the main groups being Action Congress of Nigeria (ACN), Congress for Progressive Change (CPC) and All Nigerian Peoples Party (ANPP). On May 9, the nPDP wrote a letter to the APC leadership, seeking a meeting within seven days, to address its grievances. It also alleged harassment of its members by the Federal Government. The letter was signed by Alhaji Kawu Baraje as the group’s leader. The APC leadership led by Deputy Natonal Chairman (North) Lawal Shuaibu, met with the Baraje group. A follow-up meeting was chaired by Vice President Yemi Osinbajo, where it was agreed that the nPDP team, which had Senate President Bukola Saraki and House of Representatives Speaker Yakubu Dogara in attendance, should isolate the issues for discussion at the next meeting, which is yet to hold. However, there were speculations that a meeting with the President was in the offing. But The Nation learnt yesterday that the President told a parley of party chiefs last week that he would not be meeting with the nPDP leaders because “it is a party matter”. He reportedly told the governors at the meeting he had with them, that they as party leaders in the states “should deal with all issues as they are raised and where there is need, the party leadership can come in”. The President, the sources added, however, endorsed Vice President Yemi Osinbajo’s intervention which he said should continue. 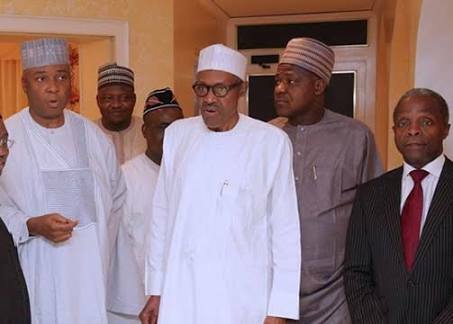 With days to Saturday’s National Convention of the APC, President Buhari’s supporters, including some governors and party leaders, have been holding marathon meetings on how to keep the party intact. There has been intense horse-trading on how to secure some of the eight key posts in the National Working Committee (NWC). Governors are being wooed to back Buhari at the convention. But the aggrieved leaders of the nPDP have kept the APC leadership in suspense on their next moves after the suspension of talks with the Presidency. It is unclear if nPDP leaders will attend the convention because some of them have complained of being shut out of the National Convention Committee. There was anxiety in the party yesterday on what the nPDP caucus was up to.